Vale is always on the trail of all that is not of this world. Investigating claims regarding the presence of ghost and other unexplained phenomenon. Both believer and skeptic, with a passion for all things paranormal, Vale is captivated by haunted history, ghosts, legends and lore. 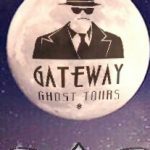 A level-headed explorer, she brings her own resourceful, analytical thinking to Gateway Ghost Tours.